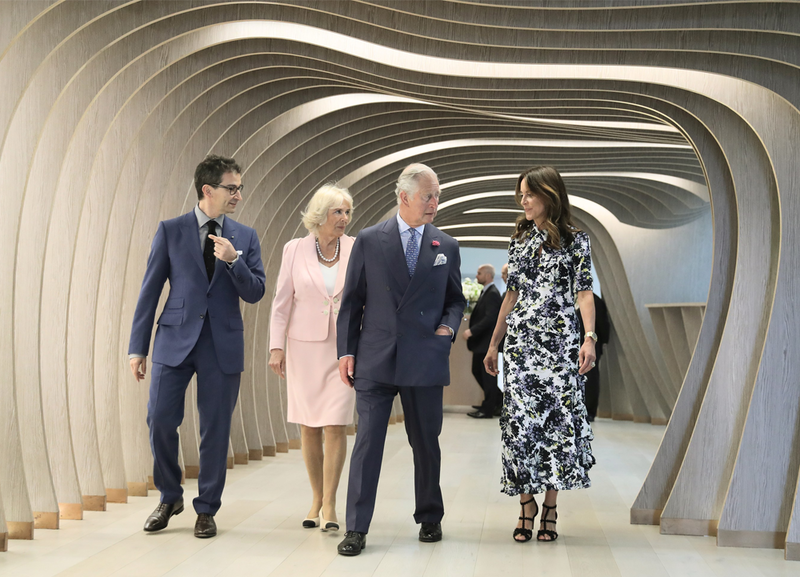 Today, TRH The Prince of Wales and The Duchess of Cornwall were given an exclusive glimpse into the future of luxury e-commerce during a tour of YOOX NET-A-PORTER GROUP’s state-of-the-art Tech Hub in White City, West London. The Tech Hub, which opened a year ago, is part of the Anglo-Italian Group’s £1 billion investment in Technology and Operations. Over 500 technologists work at the hub, which is designed to accelerate innovation and deliver best-in-class technologies, creating a new London centre for digital expertise. During the tour, led by Founder and CEO of YOOX NET-A-PORTER GROUP Federico Marchetti, in partnership with the British Fashion Council, the Royal guests were shown how the world’s leading online luxury fashion group is using Artificial Intelligence (AI) to design an unparalleled, personalised future shopping experience. The Group’s vision for the future of the homepage, individually tailored for each customer, was brought to life with concepts designed especially for Their Royal Highnesses. The prototypes, personalised based on Their Royal Highnesses diaries, featured a curated selection of luxury fashion, fine jewellery and watches suitable for their upcoming engagements. The homepages showed how data such as weather, location, purchase history and more could, at a customer’s request, be used to recommend precisely the right products, services and content, creating the ultimate luxury shopping experience, all powered by AI. The Prince of Wales and The Duchess of Cornwall also witnessed the company’s commitment to developing the next generation of technology pioneers. Both visitors joined a coding session with more than 60 local schoolgirls, aged 11 to 13, who were participating in a hackathon and fashion-related digital games as part of YNAP’s partnership with Imperial College London. With women making up two-thirds of its overall workforce, the YNAP Group is focused on encouraging girls to consider a career in technology and to developing digital skills through the lens of fashion. The partnership with Imperial College London aims to demonstrate just how rich the opportunities are in fashion technology to children in the local community. We are delighted that The Prince of Wales and The Duchess of Cornwall visited our Tech Hub today to experience the game-changing innovations we will bring to online luxury customers thanks to our team here in London. We wanted to share with Their Royal Highnesses a very human side of technology. Today, our guests had the opportunity to see how artificial intelligence can be about warmth, beauty and craftsmanship. There is nothing more human than the desire for uniqueness. One of the great advances of digital technology is the power to personalise products and services on a vast scale. We also shared our vision for preparing the digital talents of tomorrow, when coding will be as essential as reading and writing. That’s why we were particularly proud to introduce our guests to 60 young women from local schools taking part in a hackathon today as part of our partnership with Imperial College London, one of our initiatives to help educate today’s students for the future. It was a pleasure to see The Prince of Wales and The Duchess of Cornwall learning the basics of coding alongside these students. 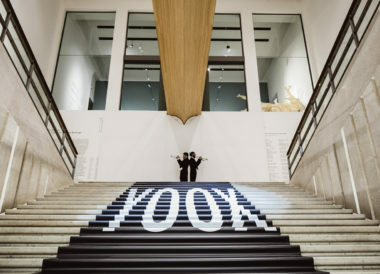 YOOX NET-A-PORTER is a global group with combined British and Italian DNA. We are deeply committed to our people and our business in the UK. Our Tech Hub is a centre of excellence providing new jobs for Britain’s best digital talent. The Prince of Wales and The Duchess of Cornwall also had the opportunity to view latest lines from British designers and sustainable brands, illustrating the British Fashion Council’s Positive Fashion initiative. 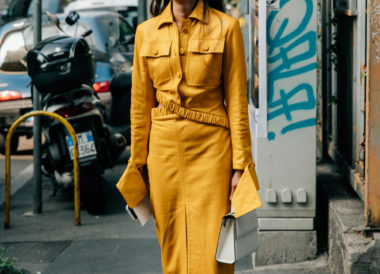 Product showcased by NET-A-PORTER included separates and accessories from pioneering British fashion designer Stella McCartney, eveningwear from Ralph & Russo and knitwear from Carcel, a sustainable brand launching on the site in June that offers training and job opportunities to female prisoners. MR PORTER highlighted the latest collection from its own label Mr P., alongside pieces from the highly successful Kingsman “costume to collection” range, inspired by the film franchise. Their Royal Highnesses also viewed fine jewellery and watches including emerald and diamond matching necklace and earrings from Amrapali and luxury watches from Jaeger-LeCoultre, Panerai and British brand Bremont. 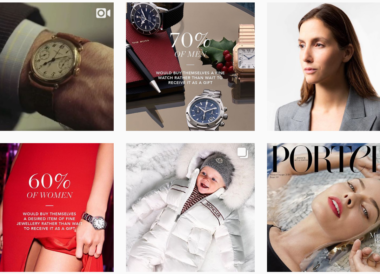 The Group has pioneered the fine jewellery and watches category online, leveraging its first mover advantage to establish itself as the leader in online sales of hard luxury products. The success to date shows that many customers now have no hesitation in making these exclusive luxury purchases online.